Glow Your Way in the Dark! Learn a new skill or pass one on to a new generation with this working glow in the dark compass! Perfect for kids and beginner adventurers! Do you remember playing games of being a jungle explorer as a kid? 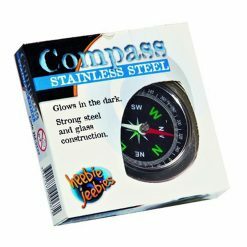 Relive those days with this stylish steel compass: it’s a functioning compass and it even glows in the dark! Lightweight, but sturdy, the metal case houses the sensitive magnetic needle. The glow in the dark face of the compass shows the eight cardinal directions (north, south, east and west) together with the ordinal directions (northwest, southwest, northeast, southeast) and the degrees of the compass are displayed around the outside of the face. This allows you to take bearings on the compass in the traditional way (i.e. what people did to navigate before there was GPS!). 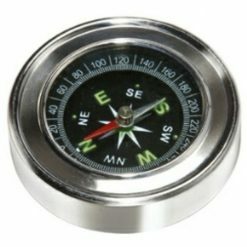 This steel compass is a unique gift idea for a child or grandchild who is thinking about or is already involved in scouting or a young person who is keen to get out and explore the wilder parts of the world. It will make an ideal Christmas or birthday gift to inspire a lifetime of learning about the great outdoors. Compasses are relatively simple objects with just one moving part and no batteries, yet they have saved countless lives and have allowed people to explore and come home safely! Knowing how to read a compass could be a lifesaving skill, so order a compass today and learn or re-learn how to take coordinates and find your way in the world with just a map and a little compass!